Boards & Waves Expo III to Showcase Surfboard Shapers, Designs and Art this weekend on Florida’s Space Coast. 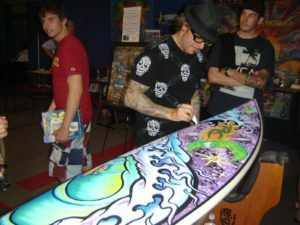 The third Boards & Waves Expo is being held this Saturday and Sunday, June 3 and 4 from 10 a.m. to 4 p.m. at the Melbourne Auditorium (625 E. Hibiscus Blvd., Melbourne, FL). The East Coast’s ONLY consumer surf expo provides attendees the opportunity to touch, feel and learn about the newest and latest surfboard designs, paddle boards, surf accessories, fin templates, foam blank characteristics and more from the industry’s top surfboard shapers, craftsmen, designers, sales reps, retailers and manufacturers in a fun, informative setting. As fans of surfing, art and our beloved ocean, we love this locally charged expo that delivers waves of fun. We hope to see you there this weekend!